“An ounce of prevention is worth ten pounds of cure.” It’s one of those things that you hear a parent say so much as a child that long after they leave you’ll still hear it, in their voice. An ounce of prevention is worth ten pounds of cure. Thanks, Mom. She’s right though. 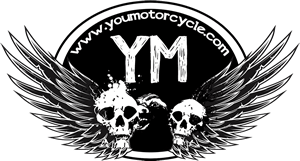 For the first five years that I rode motorcycles I didn’t have a sheltered place to park, and my bikes suffered premature wear and tear as a result. 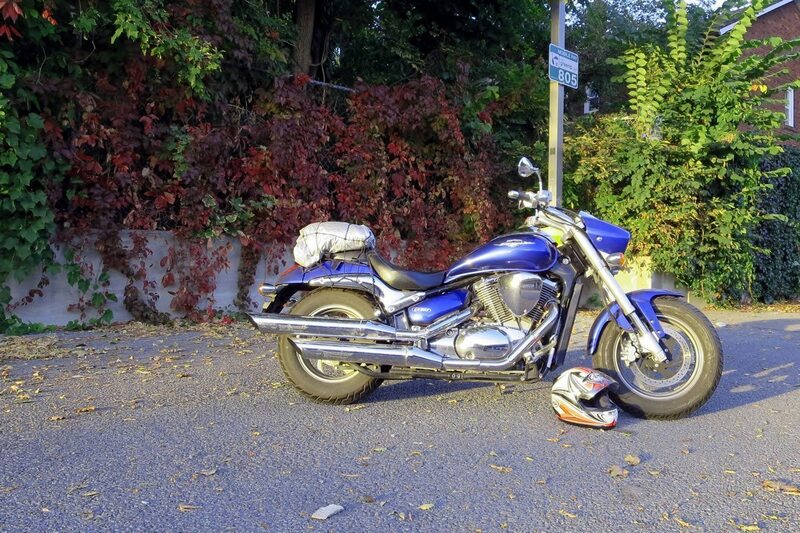 Sure, putting on my motorcycle covers, applying WD-40 liberally, polishing my chrome and putting my babies away cleaning helped, but winter is long and cold in Canada. It seemed every spring I brought my babies back to life with a little more rust than the year before. 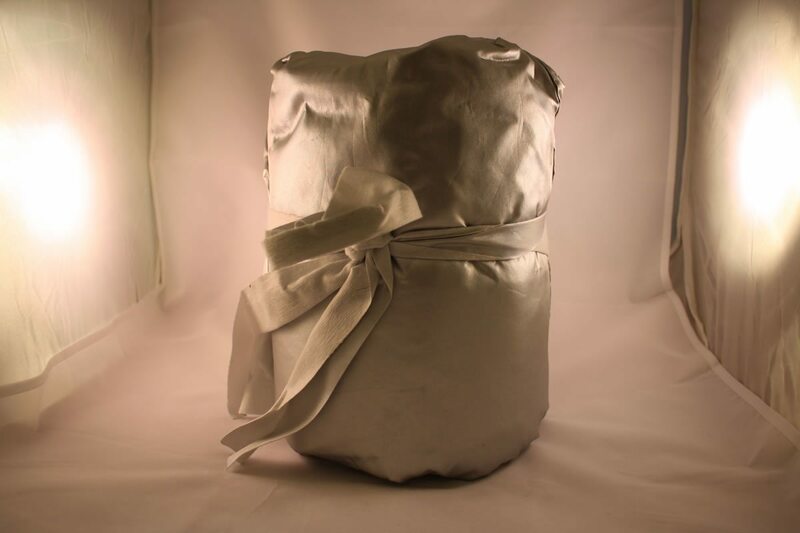 The CarCovers.com motorcycle cover comes packaged in a sling bag wrap for easy transportation. Getting it all to fit back into that little bag proves nearly impossible for a motorcyclist of limited patience. My buddy was even less fortunate. While I tried to stay with name brand motorcycle covers, he shopped low end. Often these were just headaches and problems for him. One melted against his exhaust pipe. It’s replacement blew away in a windstorm. I wouldn’t exactly call the cut “fitted” but it serves the purpose and keeps the bike well covered and protected. 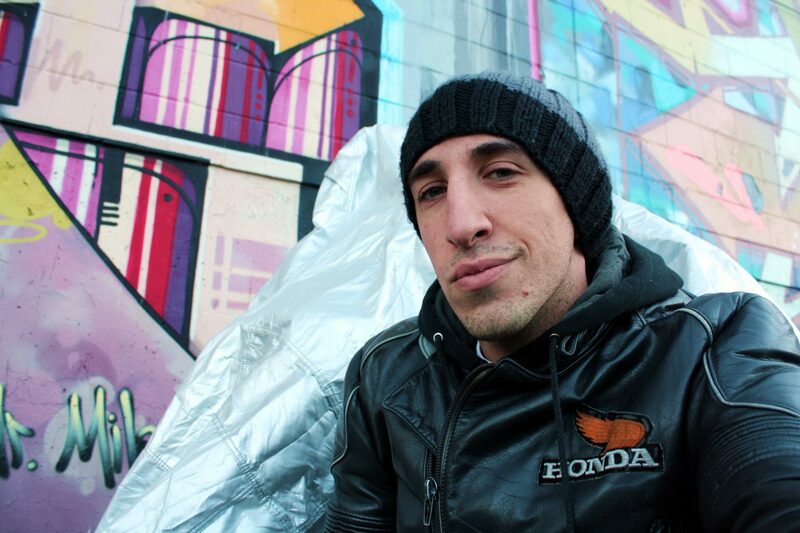 When I began hunting for a house fit for motorcycling in Toronto, Canada, the search was on. I sold my condo, bought a house with a two car garage, and somewhere in the move all of my motorcycle covers were lost. I went coverless for about a year and a half, until CarCovers sent me a high end motorcycle cover, designed specifically to fit my Suzuki Boulevard M50. Truth be told it looks a little baggy to me. More on that later. Ventilation under the mirror flaps allow for any moisture trapped under the cover to dissipate out. The model they sent me was their platinum shield motorcycle cover. That’s code name for top of the line, and it was immediately obvious why from the moment we opened the package. 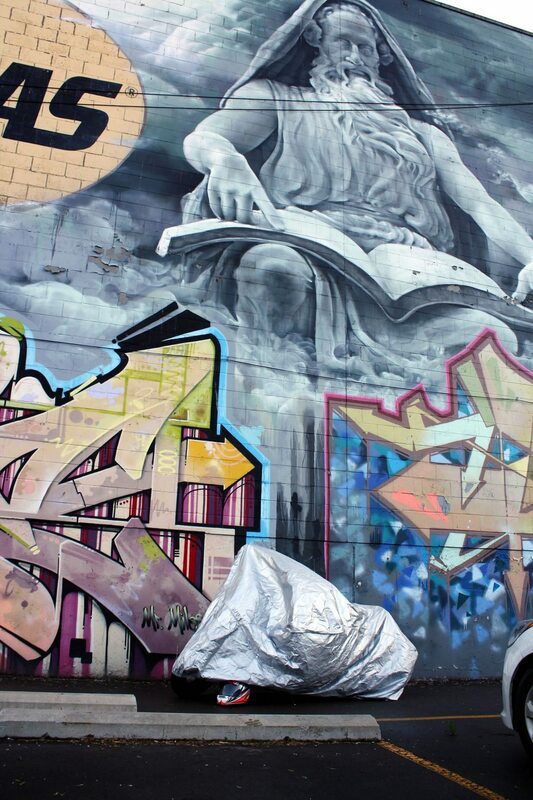 Have you ever picked up a cheap summer bed sheet, and then picked up a rich flannel bedsheet? That feeling of extra warmth and thickness is immediately apparently. 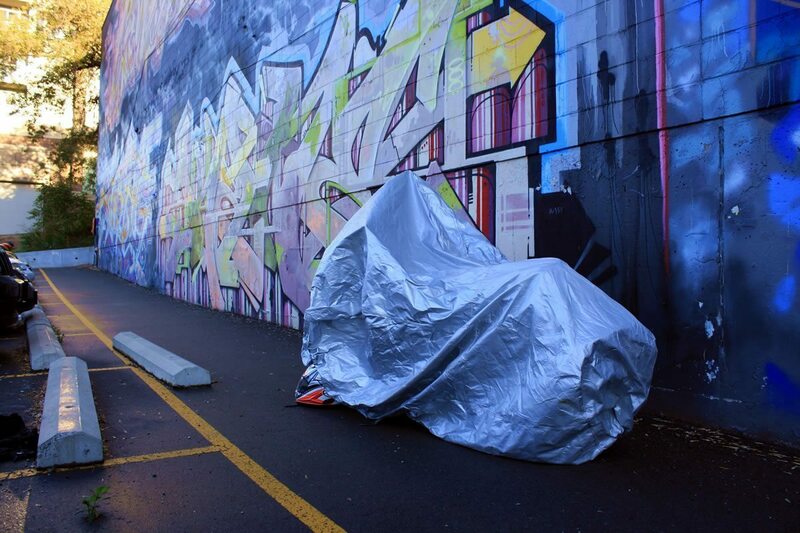 Whatever motorcycle cover you’ve been dealing with before this is instantly discredited. 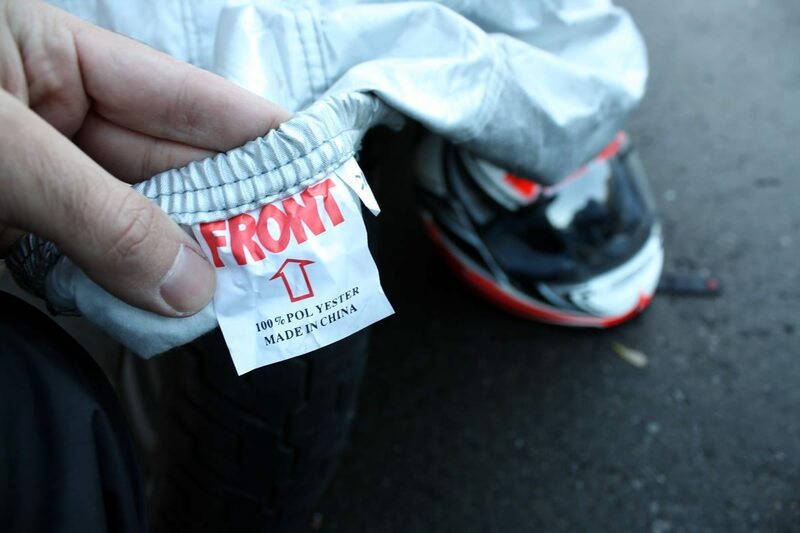 Grommets built right into the cover allow for easy use with security devices and tie downs to keep the motorcycle and cover safe from theft and vandalism. Think about how many covers you’ve gone through over the course of your life as a motorcyclist. This one comes with a ten year warranty. CarCovers clearly stands behind the product. The front tag was a nice tough. However, the cover came with a “FRONT” tag on the front, and on the rear. Oops! I’m the kind of guy who lines up my motorcycles in the backyard every few months and washes all of them. This cover made me learn something. Everyone, my garage is filthy! The bikes that weren’t covered had a filmy layer of dust on them. The Suzuki Boulevard M50? Aside from the muck of riding through rainfalls, still pretty clean! 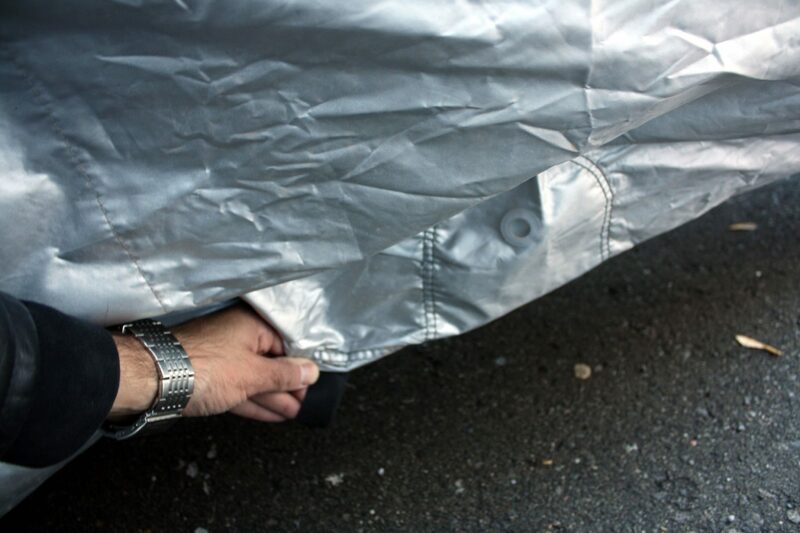 A thermal layer built into the cover helps to protect from damage against exhaust pipes and other hot components. Take note of the thick double stitching, present throughout the motorcycle cover. Let’s wrap it up… See what I did there? I made a motorcycle cover joke. It’s silver, it’s shiny, it’s not exactly a work of art, but it does rich. Seeing it up close you realize the quality and finish. Demand no less for your high end ride. I used to work in a dealership where we custom-made motorcycle covers for people with more money then sense. Our guy would take a dozen measurements with measuring tape. They cost twice as much as this cover, and were for indoor use only, however after having been around those, I’m not so crazy about the fit. 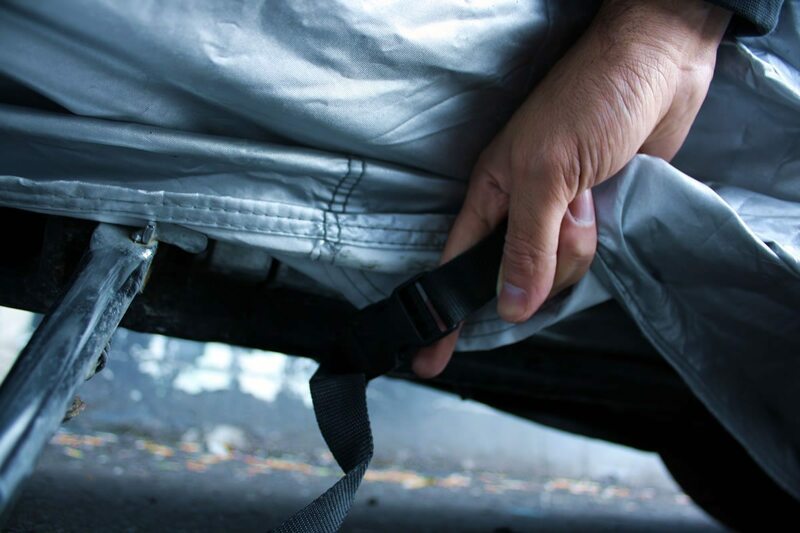 The buckle clip is easy to reach and allows for quick snapping together to hold the cover in place and avoid it from blowing off during windy storms. 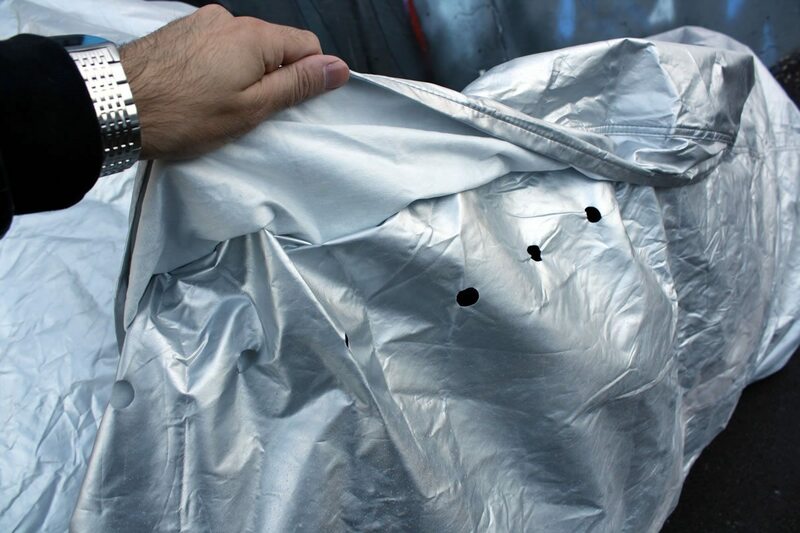 This motorcycle cover couldn’t be easier to use, in part because of the thickness of the material. It holds its shape and doesn’t stick to itself, wet or dry, making putting it on and taking it off a breeze. 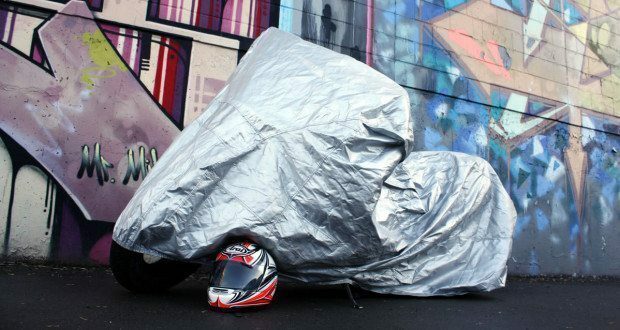 Yes, it’s a motorcycle cover that costs $99 USD. That includes free shipping, so round down a little. It’s a motorcycle cover that costs $90 and comes with a ten year warranty. Suddenly the deal sounds a lot sweeter, doesn’t it? Obviously, if you’re rocking a 1985 Honda Rebel 250 (my first motorcycle) that cost you $1,200, this isn’t the cover for you. But if you’re got something that cost you a little more, and isn’t older than you are and already rusty from decades of neglect, spend the extra coin, protect your bike, buy a cover that can stay with it for the next thirty years. A view from the back tells the story. While the quality of the CarCovers motorcycle cover was excellent, the size sent to me for my 2011 Suzuki Boulevard M50 was just too big. Want a second opinion? That’s fair. Dan Durston is a friend, scooter enthusiast, and overall awesome guy. We first met a few years ago when I was working in the motorcycle industry about four years ago. At that time, Dan’s website, MotorScooterGuide.net was already quite popular. CarCovers got in touch with Dan as well, and he ran his review of their products earlier this month. Check that out, here. 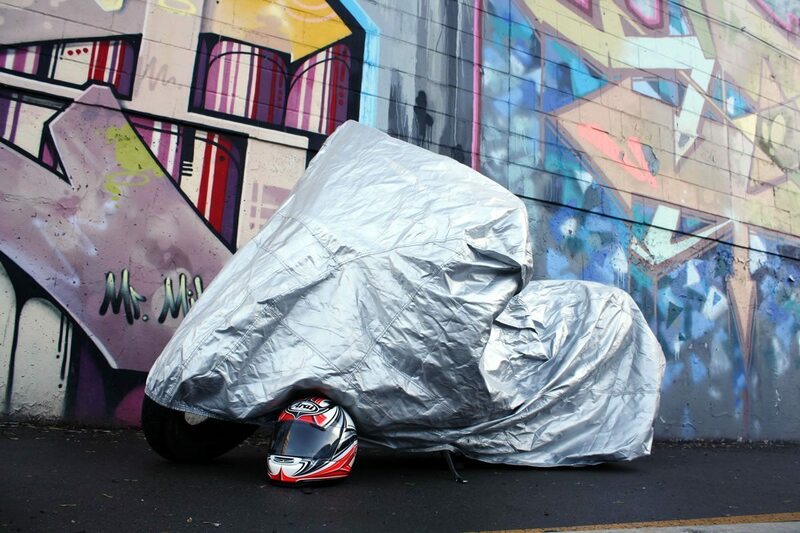 The CarCovers motorcycle cover folds up relatively well despite its thickness and can be transported on the back of a motorcycle with a cargo net for only a few dollars. 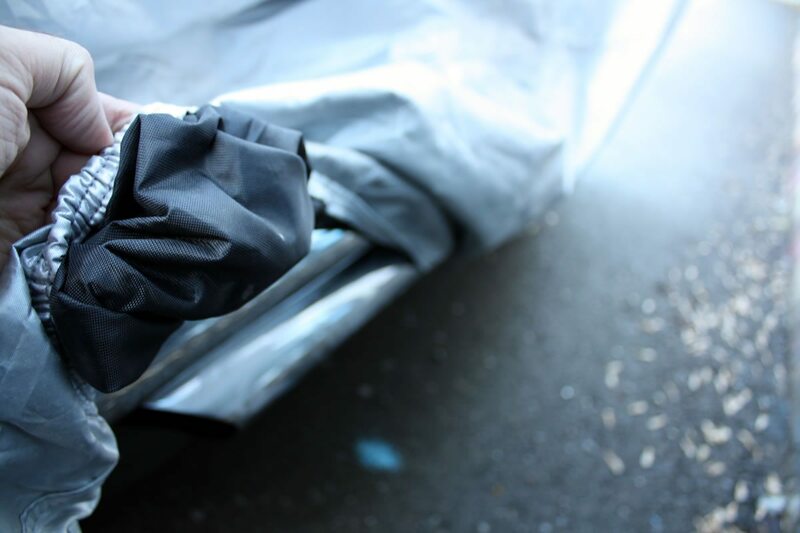 Big thanks to CarCovers for hooking up the free product review. As someone who’s worked for a two different motorcycle manufacturers and worked for a motorcycle dealership, I recognized the quality in the product immediately. These guys know what they’re doing. Be sure to give CarCovers a look. That’s it for me. Ride safe, but have fun! Previous: Would You Kiss Her?